The former detective swore he'd never play anyone's postman. But a dying friend's plea takes Donnally bearing a letter alive with tragedy toward a sister long deadthe victim of the bizarre criminality of a counter culture that had lost its way. Stunned to learn that her killer was never prosecuted, Donnally soon finds himself in battle against a broken justice system and on a trail of evil into a dangerous borderland in which the falsely pious and the wealthy abuse the young and the poor. And though each step takes him farther down a perilous path that wrenches him between his inner demons and his mission to redeem a brother's love, he won't stop until he knows the truth. For Donnally made a promise to a dead man, and he'll keep itor die trying. 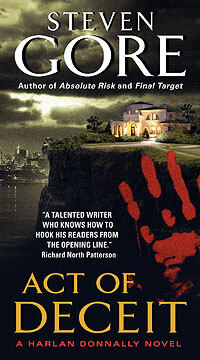 "Act of Deceit is great, one of those stay-up-all-night-reading stories that will keep you on the edge of your seat . . . Gore gets where he is going with a series of twists, turns and revelations that keep the reader on board . . . Act of Deceit is one that shines brightly."